Inez: You’re in love with a fantasy. There is a great, classic scene in Woody Allen’s Annie Hall, which has Allen’s character literally pull philosopher/literary critic Marshall McLuhan onto the frame, in order to have him directly tell another character why he is misinformed in his opinions, giving Allen the ultimate form of satisfaction. 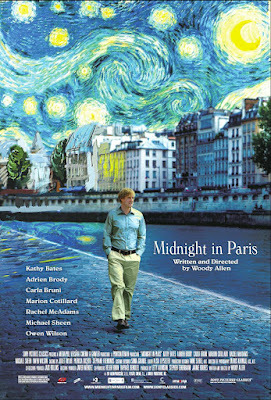 In Allen’s latest film, Midnight in Paris, the lead character gets to spend lots of time amongst all of his greatest literary and artistic idols, receiving his own wonderful type of satisfaction. Full of energy and lots of whimsy, I greatly enjoyed this Paris-based film, which has Owen Wilson headlining a fine cast in a Woody Allen story that has an actual sturdy premise, which balances the comedy with the fantastical. Now delving into my thoughts, while writing about this film, I believe this actually is the most enjoyable Allen film that I have seen in quite some time. As I tend to be fairly thorough, I may as well point out that I am going to spoil the premise of this film, which is barely hinted at in the ads for it. Owen Wilson stars as Gil, a successful, self-proclaimed Hollywood hack, hoping to write his first novel and establish himself in a setting he has been striving towards since he first became a writer. Gil is currently spending a vacation in Paris, with his fiancée Inez (Rachel McAdams) and her parents (Kurt Fuller and Mimi Kennedy). While Inez and the others are simply happy to be visiting Paris, Gil is much more smitten with the city and would love to be more a part of the place he admires so much. Gil and Inez are eventually joined in their journeys by Paul (Michael Sheen), Inez’s former professor, who specializes in acting as a, “pseudo-intellectual,” as Gil refers to him, going on and on about all the sights he takes the two on, regardless of the errors pointed out to him. And now I am really going to spoil the main premise; one night, Gil opts to walk around the streets of Paris while Inez decides to go dancing with Paul. Arriving on the steps of a church, as the clock strikes midnight, an old limousine arrives, with the people inside insisting that Gil join them. He does, only to realize that he is now in the presence of F. Scott and Zelda Fitzgerald (Tom Hiddleston and Alison Pill). The limousine arrives at its destination, which is revealed to be a 1920s setting in Paris that is filled with a number of famous figures from the era. Gil has apparently slid through time to the very period that he wishes he could be a part of. I will avoid spoiling any more of the details regarding Gil’s leap through time, but suffice it to say that the plot follows the mold of Woody Allen films, especially as it introduces the beautiful Adriana, played by Marion Cotillard, who is currently dating a certain abstract painter. Gil has certainly found a place of peace, which will happily aid in his writing, but how attached should he become? Simply in acknowledging the details of this film more and more, I find it to be truly marvelous. 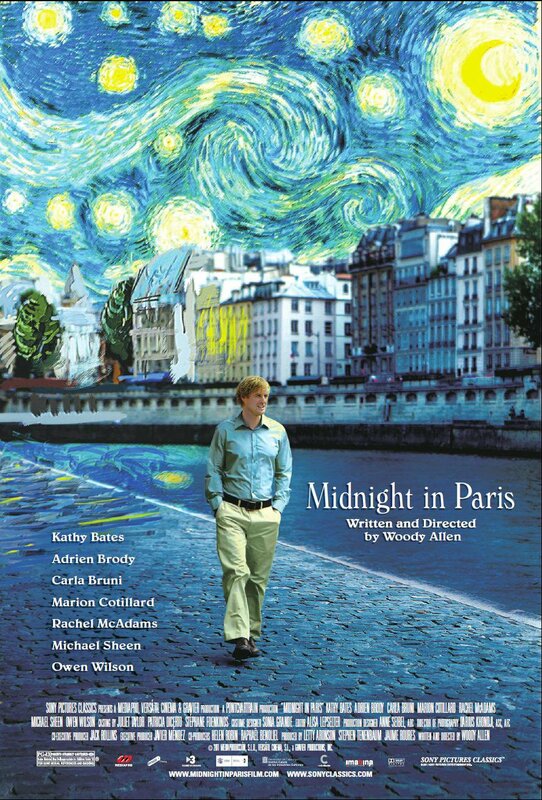 Midnight in Paris is a wonderfully enjoyable film that manages to incorporate tons of literary and artistic references without ever feeling like the film is playing its subject matter and humor too inside for all audiences. This is certainly not a stuffy film, but it is quite clever in the way it has Gil interact and acknowledge a number of famous figures from this time period. The present day aspect of this movie is great as well, playing out like many of Allen’s past films. Honestly, I would say that this is slowly climbing the ranks among my favorite Allen films the more and more I think about it. It at least suggests that Allen can still comfortably slip into the mode of writing films similar to ones from decades past. The cast is great. 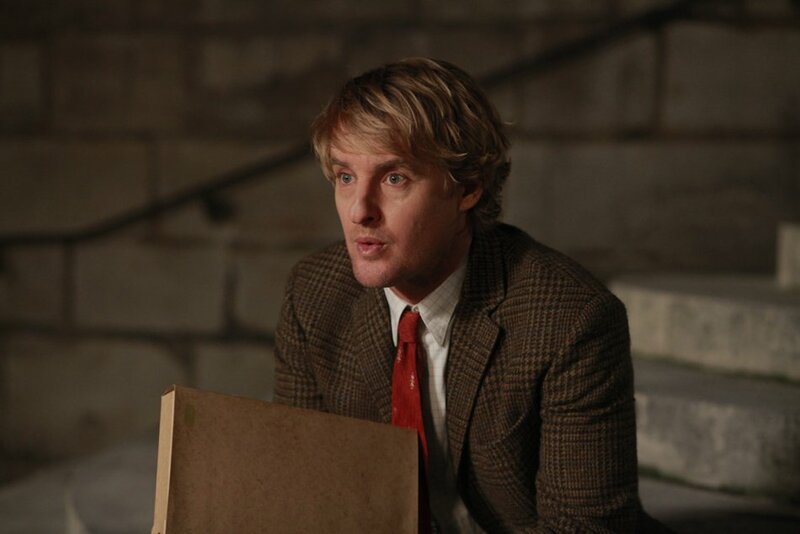 Filling in the shoes of a Woody Allen-type character, it would seem that Owen Wilson eases right into them. His style of delivery and unassuming nonchalance lends itself perfectly into what this type of character should be and how to speak Allen’s type of dialogue. Cotillard is in the role that will most likely receive much acclaim, which is unsurprising, given the way that her presence can light up a room, while also suggest much more in the way she acts. I do not quite want to reveal the roles of many of the other actors involved in the fantasy aspect of this story, but they include Kathy Bates, Adrien Brody, and my favorite, Corey Stoll as a certain masculine author. On the present side, McAdams is solid in the role of Inez, a woman that can’t quite figure out why her fiancée can’t seem happy and accepting of his success. Then you have Michael Sheen, who (between this and a guest stint on 30 Rock) seems to be easily channeling the role of the respectable weasel. To properly describe the tone of this film, it would be easy to place it near an Allen film like The Purple Rose of Cairo, except this film removes the pathos and better establishes a sense of inner discovery for its characters. The film is quite humorous and functions well as a fantasy comedy. I would only love to go on more in a different, more open conversation about how wonderfully interesting the layers of the fantastical element in this film can actually be. There is a great amount of creative energy that must have gone into the writing of this movie, which has easily been a benefit for it. I must finally point out how great of a production this film is. Never working off of a large budget, Woody Allen continues to make very good looking film regardless. Continuing his globetrotting, which has placed his last several films in various countries, Allen now brings his eye to Paris, which looks great here. Without being too obvious with his shots of places like the Eiffel Tower and Versailles, the film is wonderfully cinematic, as well as playful with the standard use of jazz music throughout. Darius Khondji, who has worked with Allen and many other well-known directors, does a lot of great things in this film to make its look match the quality of the picture. Yep, getting a thousand words in, I have basically decided that a lot of very good films need to come out this year in order to have me fill a list that accompanies Midnight in Paris as one of the best films of the year. The film is funny, clever, and full of charm; the actors are all quite good; and the fantastical element brings a lot of spark to an already entertaining film. Woody Allen is one of the most prolific filmmakers currently working and this latest feature only adds another great piece of work to his very expansive filmography. Inez: What are you doing so dressed up? Gil: I was just doing a little writing. Inez: You dress up and put on cologne to write? Gil: You know how I think better in the shower and get the positive ions going in there.